For more information on our line of Natural and Dyed Fox Tails, see tables and information below. 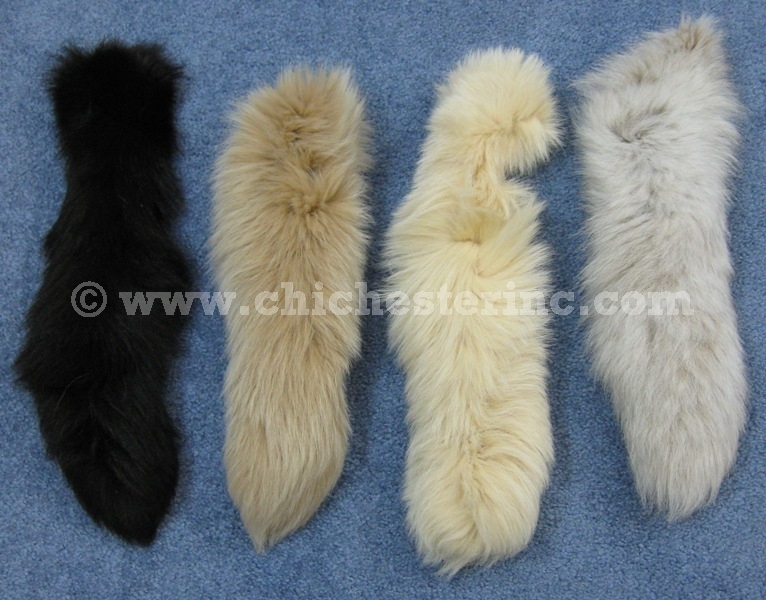 These are premium quality natural fox tails. See our Information section below for more details on our grades, fox tails and FAQs. Please note that our North American #2/3 Red Fox Tails and #2 Grade Silver Fox Tails have "messy" hair that does not lay flat. Left: Assorted Dyed Blue Fox - available colors vary. 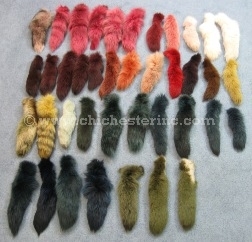 Right: Assorted Dyed Silver Fox - available colors vary. 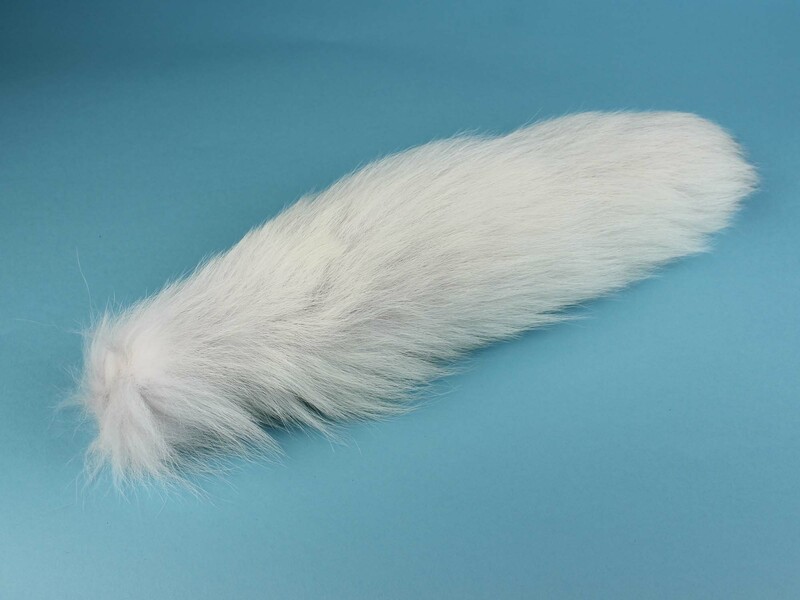 Most of the dyed fox tails come from either natural blue fox skins or white shadow fox skins. We also have some Dyed Silver Fox Tails available. Our Premium dyed fox tails are made from fashion-quality Finnish blue fox tails. 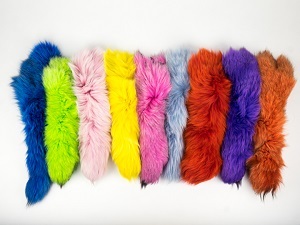 Long and plush, they come in nine vibrant colors, and averaging 13" to 18" long, and 4" to 5.5" wide. Genus and species for Arctic, Blue and Shadow fox: Vulpes lagopus. Genus and species for Marble, Indigo, Crystal, Cross, Red, Golden Island and Silver fox: Vulpes vulpes. Genus and species for American Gray fox: Urocyon cinereoargenteus. The video above shows the different kinds of natural fox tails. Unlike most manufactured items, furs and fur products can vary tremendously in quality. We have seen furs that range in price from US$1.00 each to US$100.00 for the same animal. There is also some variation in the tails that we offer. All of the tails in this section are "decent." The main difference between the lower price point and the "premium" tails is the quality and appearance of the tail. For example, a $10.00 blue fox tail may be shorter and thinner than one that costs $15.00. In general the lower the price, the lower the quality of the tail. The higher the price, the higher the quality of the tail. What we are looking for is shape, length, width, fluffiness, color, etc. These are a cross between a silver fox and a red fox. They measure approximately 18" long. Product of the USA or Canada. The genus and species is Vulpes vulpes. These are a cross between a silver and blue fox. The genus and species is Vulpes vulpes. 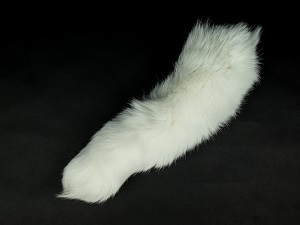 These white shadow fox tails come from awesome, fashion quality skins from Finland that sell for US$195.00 or more each. They are XXXL and XXXXL tails (18" to 22" or more). The hair on these tails is usually about 2" to 2.5" long. Click HERE for a large picture of the white shadow fox tail. The genus and species is Vulpes lagopus. Our supplies of fox tails varies. We may have what we think is a good selection and adequate stock and then have someone buy every tail we have in a certain species. Stocks can change quickly, so please feel free to call us at 1.800.206.6544 if you have any questions. 1) What is the difference between Australian Red Fox Tails and North American Red Fox Tails? Both tails are an average of 14" in length. The Australian tails have more black hair in them and so appear slightly darker. The North American Tails are bushier, while the Australian Tails are slimmer (similar to that of a raccoon). Click HERE for a picture. 2) Can you make these into key chains? Yes, we can for an extra US$5.00 per tail. Just let us know if you want a key chain. 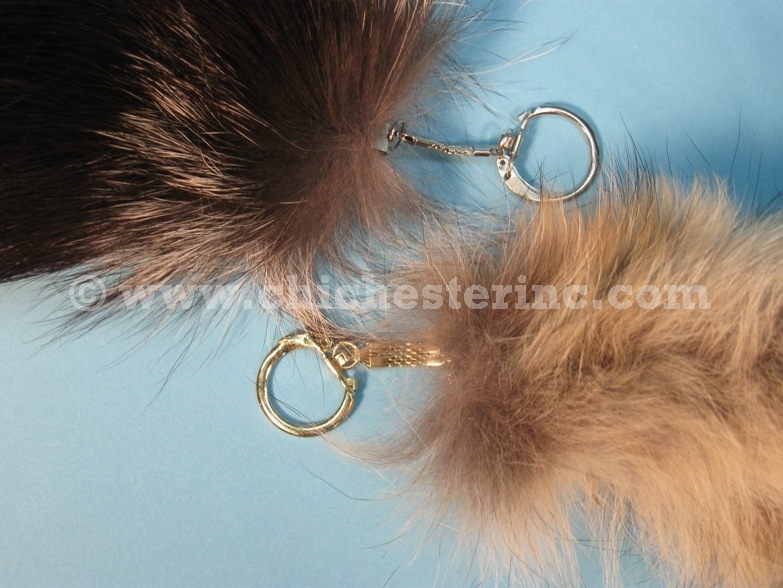 We use nickel or gold mesh key chains. If you prefer, we can use a tan or black leather strap instead of a key chain. Click HERE and HERE for pictures. 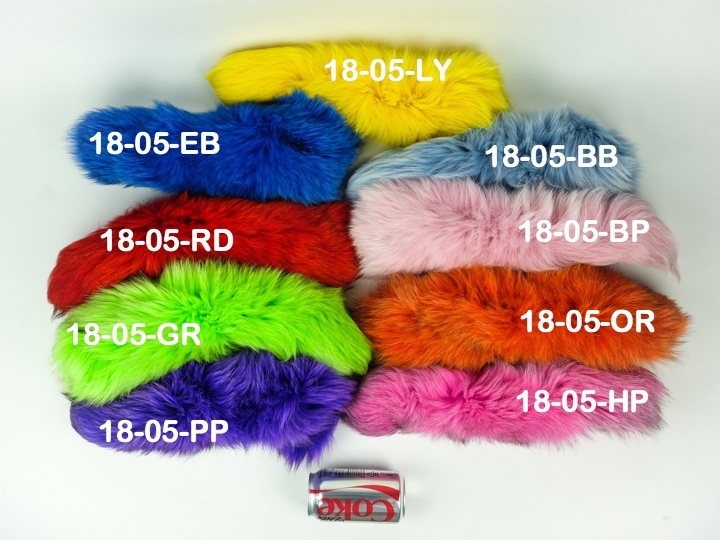 3) Are the blue fox tails dyed? No, this is the natural color of the tail. Blue fox tails are often used as the base when dyeing tails. For example, a black-dyed tail most likely is a blue fox tail that was dyed black. 4) What fox is used for the black dyed fox? The most common black dyed tail is from the blue fox. Occasionally, shadow fox tails are used. Both species are from Vulpes lagopus. 5) Do you have other tails? Yes, we have coyote, skunk, badger, etc. Click HERE to go to the main tail section. 6) Can I get a fox tail for my Vespa or Lambretta? Yes, we have many customers who want to purchase a fox tail for their Vespa or Lambretta motor scooters so they can look like the ones in the movie Quadrophenia. 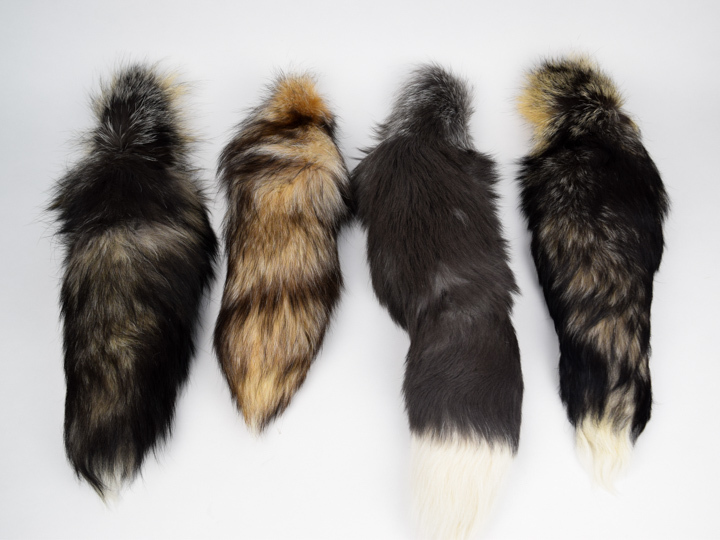 We recommend the silver fox tail or American Red Fox tail. Click HERE for a gallery of pictures of motorbikes and scooters with our fox tails on them. 7) Which tails have the longest hair? Shadow fox tails have 2" long hair, but Silver fox tails have the longest hair, with some as long as 3". 8) How much does a tail weigh? 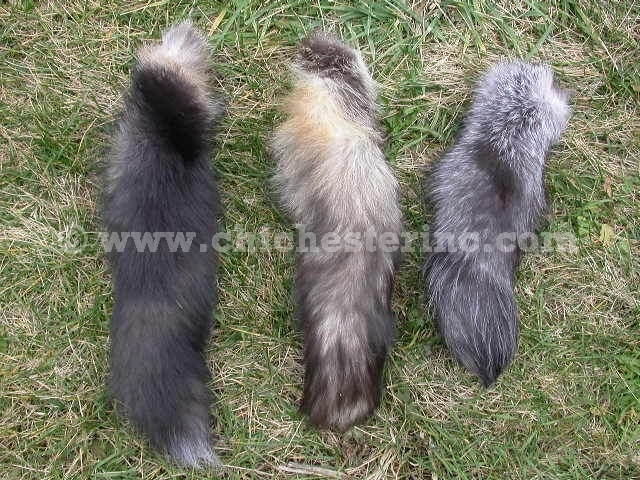 Fox tails weigh approximately 1.5 oz.